I was late getting into Chicago due to Storm Warnings. After I arrived I called Bobbie who was circling the airport in the thunder, lightning and rain. Berta was with her. I waited and waited for my luggage and tried to call Bobbie again, but no answer. Then Berta showed up inside with me. She had found Donna who was now with Bobbie. Berta and I ended up being herded into a stairwell to wait out a Tornado Warning! Berta and I spent some time hiding in the stairwell because of the warning. I thought it was funny but wasn't scared. I wasn't about the let mother nature mess with my once in a lifetime chance ! 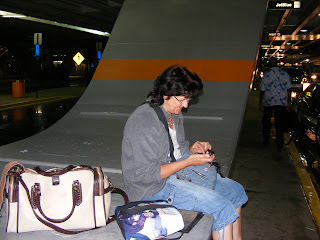 The picture above is when we finally got out of the stairwell and were waiting outside for Bobbie to pick us up (with Donna). We we went and checked into the hotel. I met Therese when I walked into the wrong hotel room! Their door was slightly ajar and I wondered who was in my room! When I saw her I gave her a big hug. I probably scared her to death. 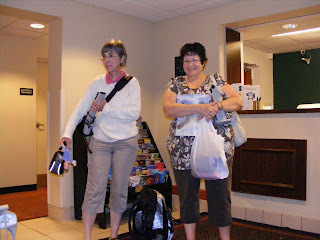 Therese is on the left and Donna A. is on the right. They shared a room and I had a room across the hall. It was nice to have all the peace and quiet. (I have eight kids whom I left with their dad for the trip! 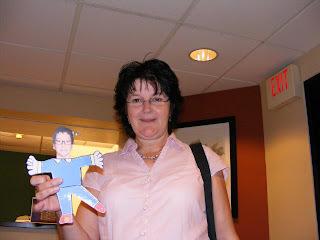 hee hee) The other picture is of Berta with Flat Francois who was a wonderful addition to uor party. The next day, we got to the fun of working. 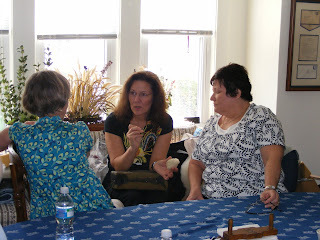 Berta of ThReAdTeDs.com taught us Oya Lace. 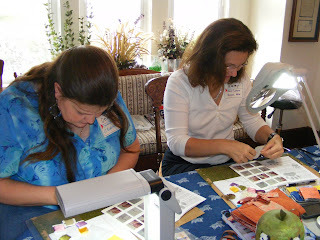 She made amazing, detailed kits for the workshop. 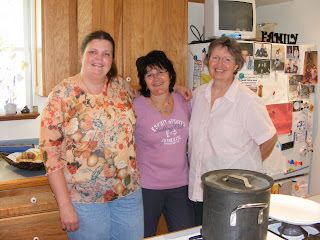 Tammy of Boston Bears is on the right in the picture with me. The other is a video of a funny moment, you are seeing Bobbie, Berta, and Therese having fun and Donna working very hard. All of the people I met were amazing, wonderful people. I still get a little emotional when I think about them. Can you miss people you only knew for four days? 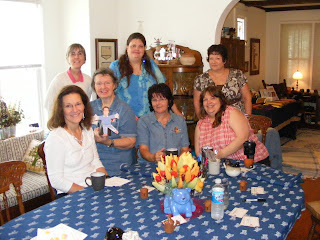 Bobbie taught us needle felting. We made roly poly pandas. I will post a picture of mine when it is done. 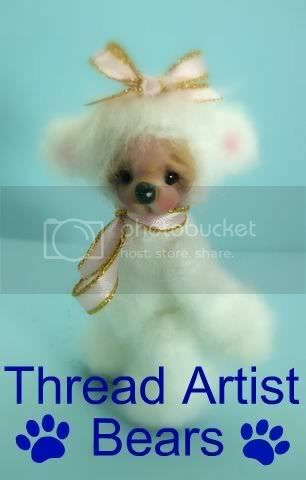 Tammy is also an excellent needlefelter and helped us with our work. 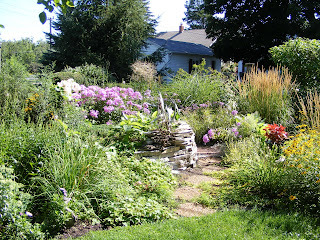 This is a picture of Bobbies Beautiful Yard. Tubularize (a description of a medical procedure involving skin, that we found ourselves re-using to describe our oya and felting works). they were all so very, very, nice.